FIRST-CLASS PASSENGER COMFORT FOR UP TO 15 IT PUTS YOUR BUSINESS IN THE DRIVER'S SEAT. Best-in-class vehicle confi gurations. * Available seating confi gurations for up to 15. Transit Passenger Wagon offers three roof heights, three body lengths and three engine choices to meet your specific needs. And you can get up to 100.5 cubic feet of cargo space behind the last row of seats. 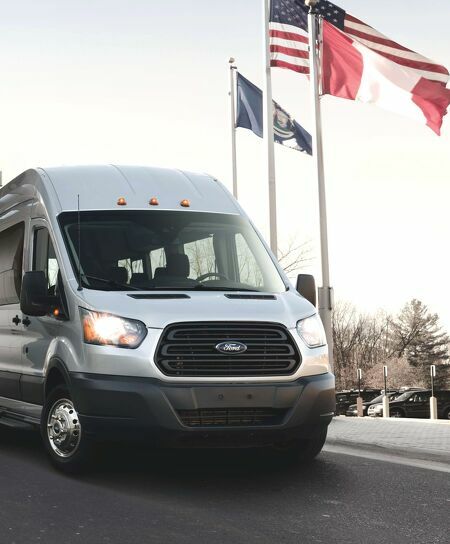 ** Exactly what you'd expect from America's best-selling full-size commercial van.† THE FORD TRANSIT FORD.COM /// * Class is Full-Size Vans based on Ford segmentation (based on body type, body length, wheelbase and roof height). **When properly equipped. † Based on total U.S. reported sales (2017 CY).